The process of testing a network installation to ensure its adherence to specified standards is called certification, and often requires hardcopy documentation as proof of adherence to standards. 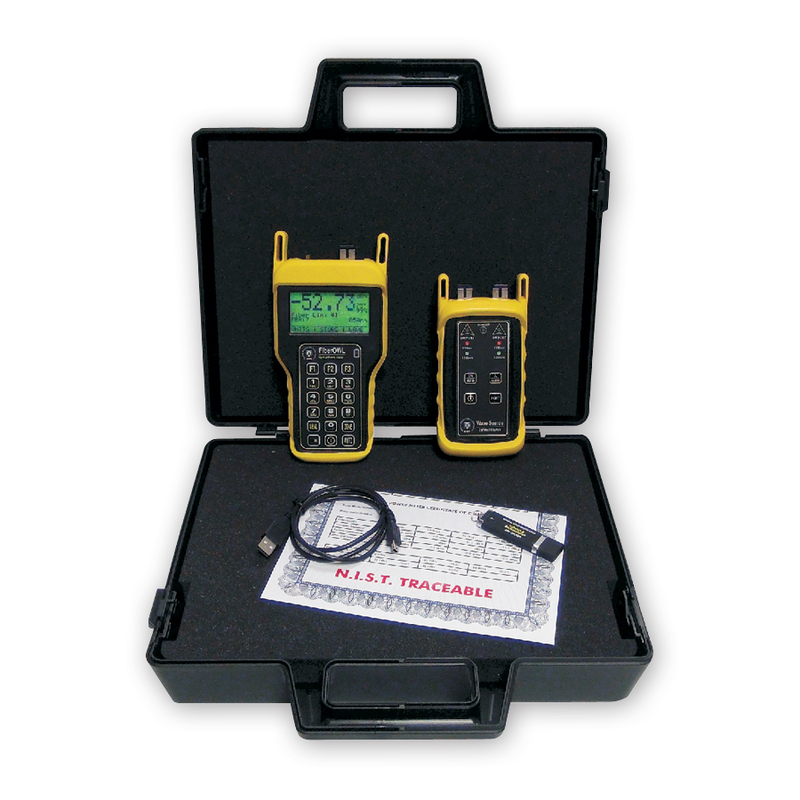 The Installer Series Quad MM/SM Test Kit contains the tools necessary for certifying fiber optic links against a myriad of cabling standards, including two user-customizable standards, in both multimode and singlemode networks. The WaveSource Quad fiber optic light source contains all four popular industry-standard wavelengths in a single unit, designed for accurate testing and certification of multimode (850nm & 1300nm) and singlemode (1310nm & 1550nm) networks. Its quad-wavelength outputs are temperature-stabilized for accurate measurements, and are housed in SC connector ports. It also includes intelligent automated testing functions, such as automatic dual-wavelength storage and auto-wavelength recognition, which reduce testing time and human error. The WaveSource MM fiber optic light source is designed for accurate testing and certification of multimode (850nm & 1300nm) networks. Its dual-wavelength outputs are temperature-stabilized for accurate measurements. The Fiber OWL 4 BOLT / WaveSource VFL MM Test Kit contains the tools necessary for certifying fiber optic links against a myriad of popular cabling standards in multimode networks. The WaveSource MM VFL fiber optic light source is designed for accurate testing and certification of multimode (850nm & 1300nm) networks. Its dual-wavelength output is temperature-stabilized for accurate measurements, and the integrated VFL is used for quick visual fault location. The WaveSource MM VFL has built-in auto-wavelength switching designed to synchronize the wavelength of the Fiber OWL 4 BOLT with the current output wavelength. Two connector options are available (ST and SC). The Fiber OWL 4 BOLT SM Test Kit contains the tools necessary for certifying fiber optic links against a myriad of popular cabling standards in singlemode networks. It also includes intelligent automated testing functions, such as automatic dual-wavelength storage and auto-wavelength recognition, which reduce testing time and human error. The WaveSource SM fiber optic light source contains all four popular industry-standard wavelengths in a single unit, designed for accurate testing and certification of singlemode (1310nm & 1550nm) networks. Its dualwavelength outputs are temperature-stabilized for accurate measurements. The WaveSource SM has a built-in auto-wavelength switching protocol designed to synchronize the wavelength of the Fiber OWL 4 BOLT with the current output wavelength. Three connector options are available (ST, SC, and FC), and is upgradeable to include 850 & 1300nm multimode sources. The Fiber OWL 4 / Dual OWL / Laser OWL Test Kit contains the tools necessary for certifying fiber optic links against a myriad of popular cabling standards in singlemode and multimode networks. The Dual OWL fiber optic light source is designed for accurate testing and certification of multimode networks. Its dual-wavelength outputs are temperature-stabilized for accurate measurements. Two connector options are available (ST and SC). The Laser OWL fiber optic light source is designed for accurate testing and certification of singlemode networks. Its dual-wavelength outputs are temperature-stabilized for accurate measurements. 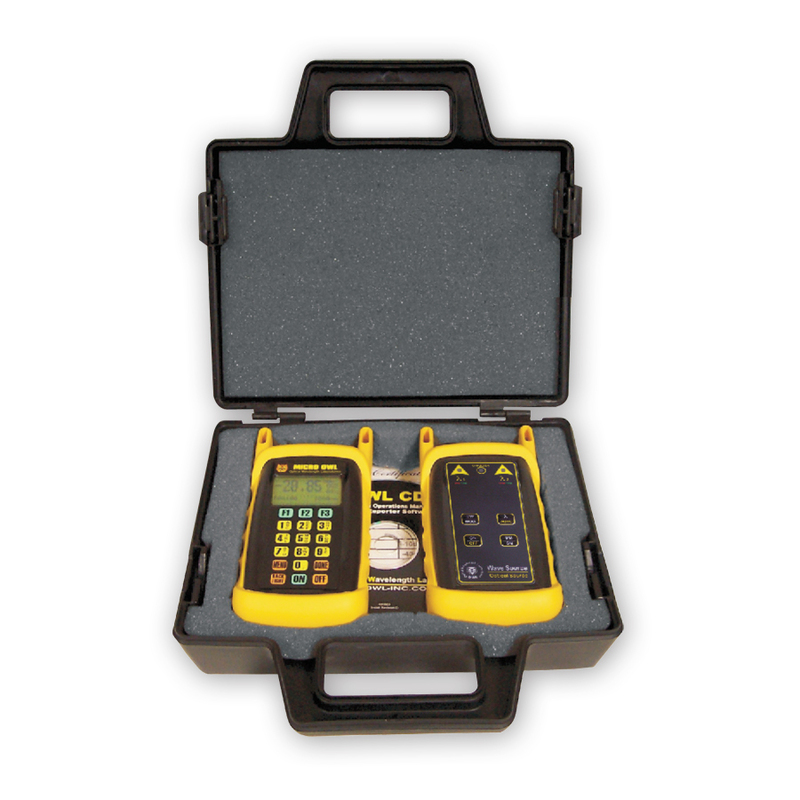 The Fiber OWL 4 / Dual OWL 850 / Laser OWL 1310 Test Kit contains the tools necessary for certifying fiber optic links against a myriad of popular cabling standards in singlemode and multimode networks. 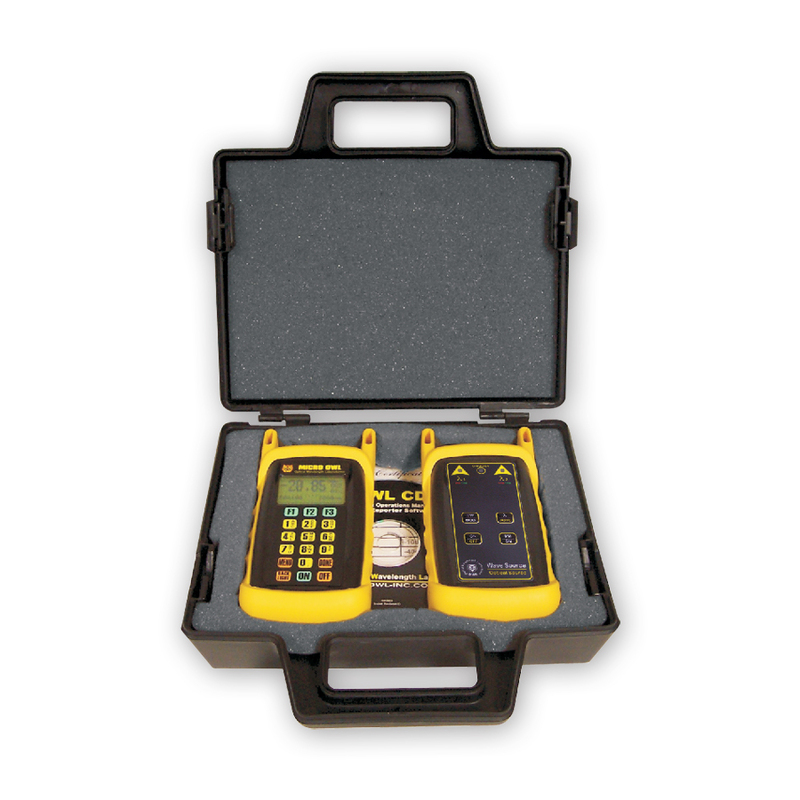 The Dual OWL 850 fiber optic light source is designed for accurate testing and certification of multimode networks. Its 850nm output is temperature-stabilized for accurate measurements. Two connector options are available (ST and SC). 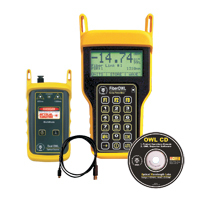 The Laser OWL 1310 fiber optic light source is designed for accurate testing and certification of singlemode networks. Its 1310nm output is temperature-stabilized for accurate measurements. The Fiber OWL 4 BOLT Dual OWL 850 Test Kit contains the tools necessary for certifying fiber optic links against a myriad of popular cabling standards in multimode networks at 850nm. The Dual OWL 850 fiber optic light source is designed for accurate testing and certification of multimode networks at 850nm. Its output is temperature-stabilized for accurate measurements. Two connector options are available (ST and SC). The Fiber OWL 4 Dual OWL Test Kit contains the tools necessary for certifying fiber optic links against a myriad of popular cabling standards in multimode networks. The Dual OWL fiber optic light source is designed for accurate testing and certification of multimode (850nm & 1300nm) networks. Its outputs are temperature-stabilized for accurate measurements. The Fiber OWL 4 / Laser OWL Test Kit contains the tools necessary for certifying fiber optic links against a myriad of popular cabling standards in singlemode networks. The Laser OWL fiber optic light source is designed for accurate testing and certification of singlemode (1310nm & 1550nm) networks. 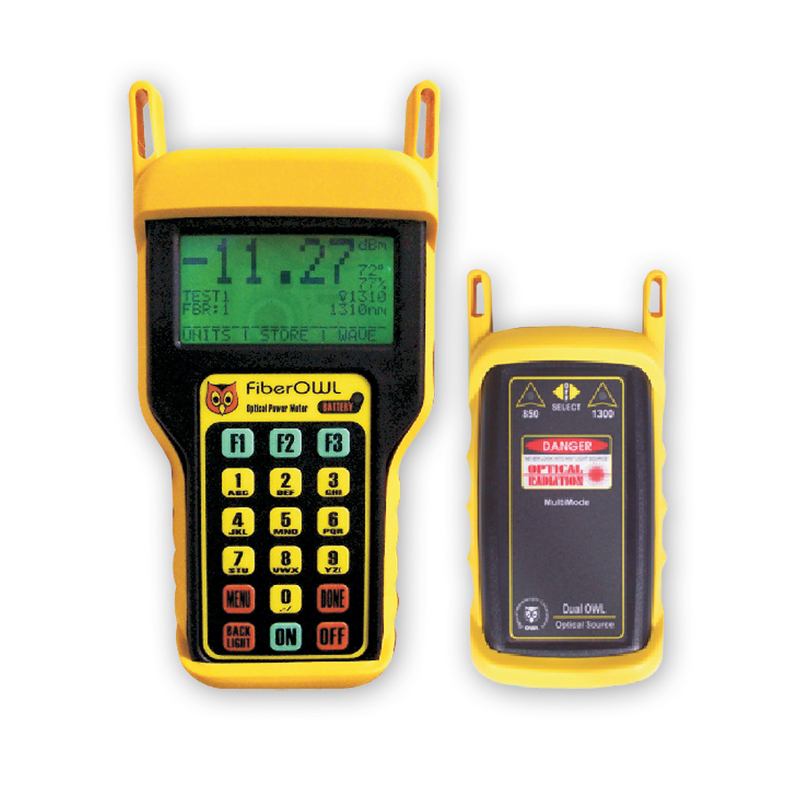 Its dual-wavelength outputs are temperature-stabilized for accurate measurements. Three connector options are available on the Laser OWL (ST, SC, and FC).